Imagine that you have a large road map, and you need it folded and unfolded. What would it look like? 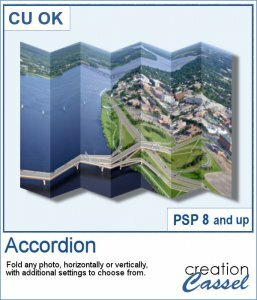 This script will actually fold any image (whether it is a roadmap or not) into up to 12 folds, horizontal or vertical. You choose how deep you want the folds and everything will be done in seconds. No need to measure, cut, distort or align anything. The script does all the work, effortlessly.